A Russian cargo ship hobbled by a jammed navigation antenna glided into its port on the International Space Station early Friday, completing a dramatic automated rendezvous. After final checks to make sure the stowed antenna would not interfere with an airtight structural seal, the ship was safely locked in place. 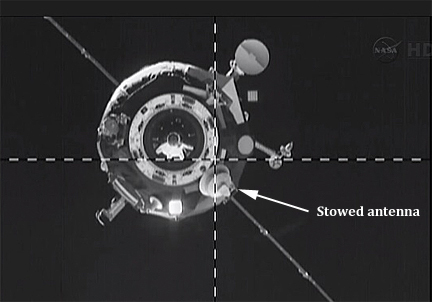 Loaded with 3.1 tons of supplies and equipment, the Progress M-19M/51P spacecraft's forward docking probe engaged the capture mechanism of the Zvezda command module's aft port at 8:25 a.m. EDT (GMT-4) as the two spacecraft sailed 261 miles above the Kazakhstan-China border. "We have contact," someone said. "We have capture." Before retracting hooks to pull the craft in for a so-called "hard dock," Russian flight controllers asked cosmonauts Roman Romanenko and Pavel Vinogradov to listen for "grinding" sounds or any other unexpected noises that might indicate the stowed antenna was rubbing against station hardware. Vinogradov said "there was nothing that sounded strange. ... It's probably all normal." Then he jokingly offered to stage an emergency spacewalk for an up-close inspection. Instead, the docking system hooks were retracted, pulling the spacecraft firmly into place at 8:34 a.m.
"So everything is normal and congratulations," Vladimir Popovkin, head of the Russian federal space agency, radioed the crew. Russian engineers earlier concluded the supply ship could safely execute an automated docking using a software patch instructing flight computers to ignore the undeployed antenna. As always with Progress dockings, cosmonauts in the Russian segment of the station -- in this case, Romanenko and Vinogradov -- were standing by to remotely guide the ship to docking if the automated KURS navigation system has any problems. But the software patch apparently worked as designed and the cargo ship moved in for docking in the normal fashion, albeit slower than usual to give engineers a good look at the antenna through the station's camera system. The video showed the antenna folded up against the side of the Progress with one edge appearing to slightly overlap the craft's docking ring. Earlier, U.S. flight controllers told station commander Chris Hadfield it might not be immediately possible to achieve a hard dock. "Just a heads up on the current situation with the 51P docking," David St. Jacques radioed from NASA's mission control center in Houston. "TsUP (Russian mission control) is going forward with the automated docking, expected at 12:26 GMT as planned. We're going to support and we have put ISS in a safe config. We just handed over attitude control to the Russian segment. "A heads up, should we end up with an incompletely docked Progress we might end up in free drift longer than usual and we're working a plan for that contingency. We're also discussing with our Russian counterparts whether we need any additional precautions with respect to ingressing the Progress." "Copy all, that's clear. Thanks, David," station commander Chris Hadfield replied. As it turned out, the contingency plans were not needed. The Progress M-19M spacecraft was successfully launched from the Baikonur Cosmodrome Wednesday. The climb to space went smoothly and the spacecraft's two solar arrays unfolded as planned a few moments after reaching orbit. But one of five antennas used by the ship's KURS radar rendezvous system failed to deploy. The KURS system, used by both Progress and manned Soyuz spacecraft, measures differences in radar signal strength to home in on the space station. The jammed antenna, wrapped in white insulation blankets, normally is used to provide orientation data during final approach.